Bristol is one of the 10 partner cities who took part in the URBACT Sustainable Food in Urban Communities project from 2012-2015. The URBACT Thematic Network “Sustainable Food in Urban Communities” is a project involving 10 European cities that wish to grow, deliver and enjoy more sustainable food: they are looking for joint, effective and sustainable solutions to develop low-carbon and resource-efficient urban food systems. As the final deliverable of the project, each city was tasked with coming up with its own Local Action Plan. At the final event, which was held in Bristol on 15th March 2015, summaries of each Local Action Plan were made available to all the participants to share the results of the thinking and inspiration that had happened over the 3-year span of transnational meetings, workshops, and conferences. You can fnd Bristol’s contribution to that thinking and sharing process here. We hope to have the full report available soon. 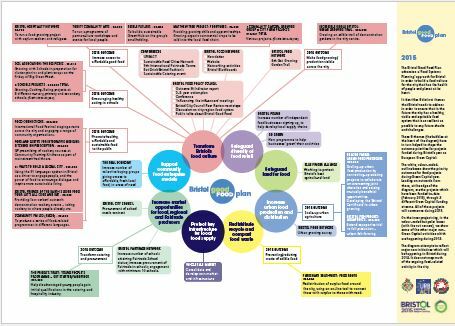 You can see a visual representation of Bristol’s 1-year action plan (as of 23rd March, 2015) here. This work is forming the basis for a longer 3-to-5-year action plan which is currently in development.